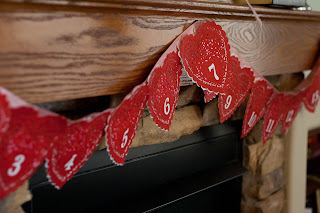 I know it seems like just yesterday that I posted my winter mantle. But Beth @ The Stories of A2Z said that it was time to change it up for Valentine’s Day, so I obliged. I’m happy to report that the only money spent (this year, anyway) for my mantle makeover, was for the candy (marshmallows) in the vases (dishes). 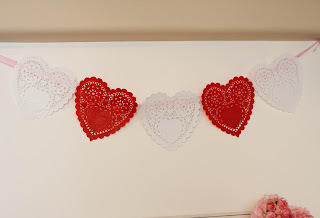 Inspired by these paper heart doilies I picked up at Target after Valentine’s last year for super cheap, I wanted to go for an old-fashioned Victorian feel. I also wanted to build on what I had recently put together for my winter mantle, rather than start from scratch. The doily garlands are made simply by hot-gluing the hearts on to pink ribbon. There was actually a bit more to the bottom one, but you are going to have to wait for more about that and the function it will serve. I used my Silhouette to cut out the cute numbers (Chelsea font), and if you didn’t already have lacy hearts, I’m sure you could find a graphic and cut them out with your Silhouette (assuming you have one). The focal point is this frame again (remember the repurposed Indian chief frames?) I really took some short-cuts this time. I didn’t want to take out the print I just framed (it’s a bit of a pain to get into this frame), and I knew this was short-term, so I decorated on top of the glass. That is plain pink wrapping paper (attached with the delicate painters tape). I printed a fabulous Vintage Valentine graphic from The Graphics Fairy, complete with cherub! And I thought the crepe paper would make it look a bit like a giant home-made Valentine from the Victorian Era. I just made several pleats and attached it to the burlap section with small pins (and some hot glue here and there to help hide where the pins are). It should all come off really easily. 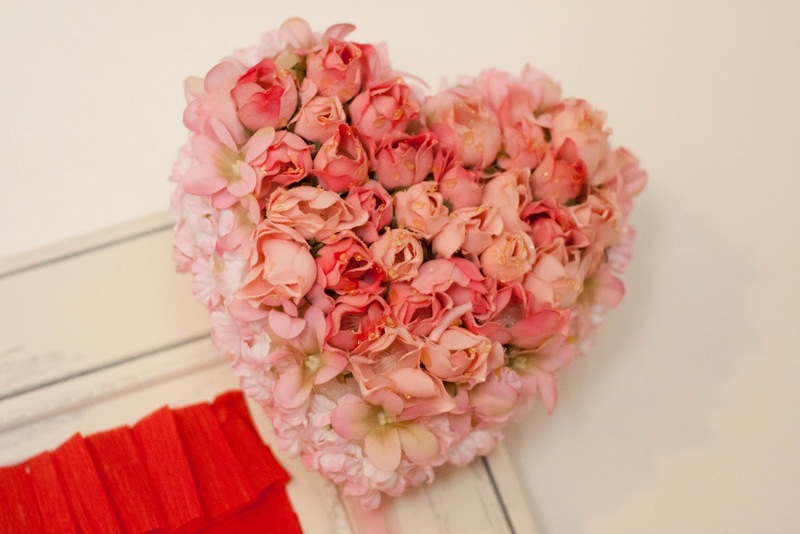 I made this rose heart several years ago to hang kind of like a wreath. For this mantle, I just pinned a loop of ribbon into the foam in back, and hung the ribbon over the corner of the frame. 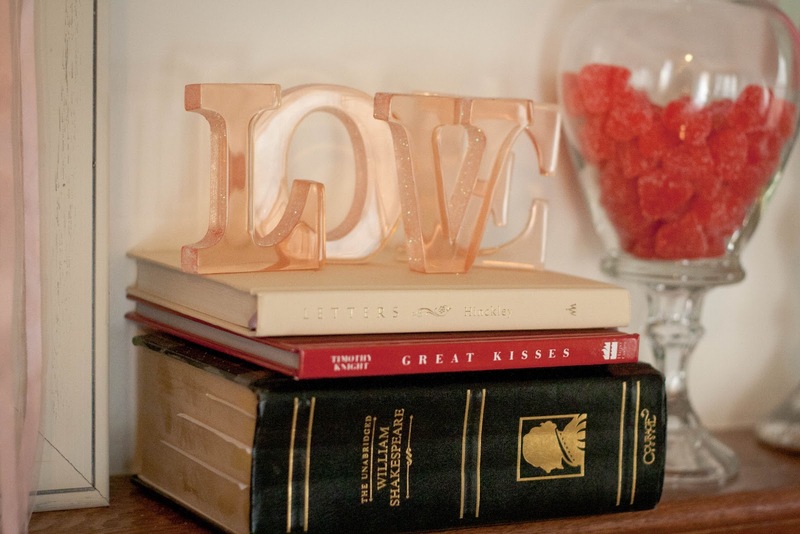 Speaking of great kisses, why not celebrate some real romance on the mantle. 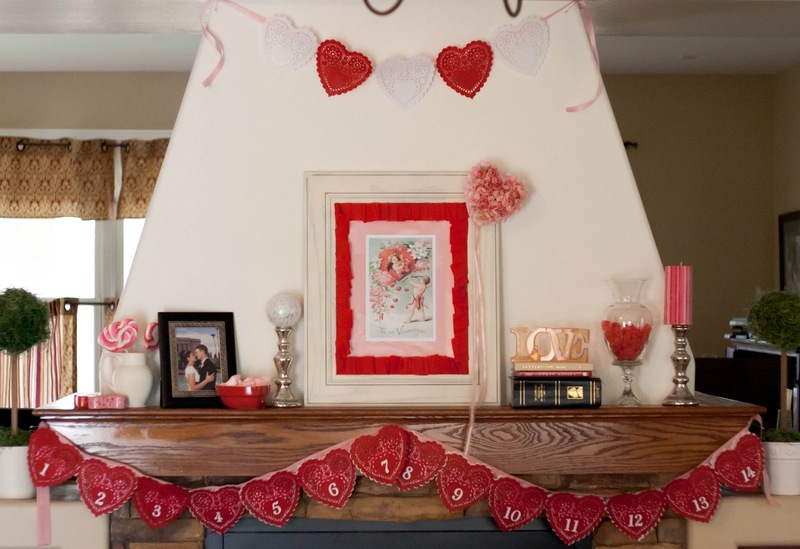 Check out all of the other beautiful and inspirational mantles at Beth’s Valentine’s Mantle Linky party. 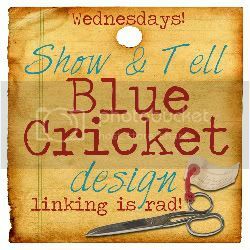 Also joining in Blue Cricket’s Show and Tell for the first time. That should help keep you busy while our judges deliberate and select the party party finalists! Give us a couple of days. 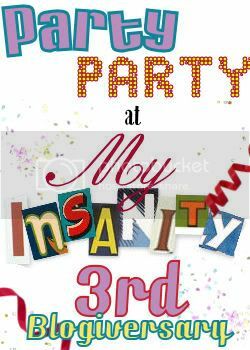 There are 132 amazing parties to sort through! You want to check them all out! I love this! What is is about vintage-ee Valentines? They are so very awesome! 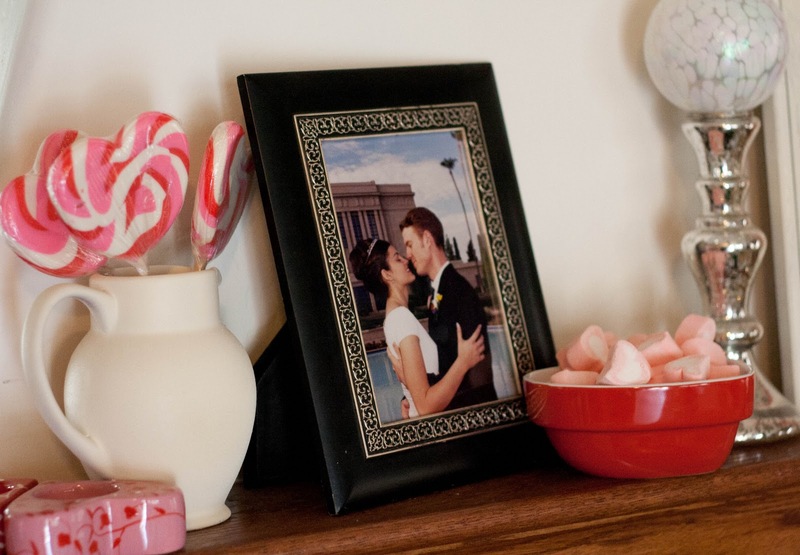 And I adore the addition of your wedding photo. What a great idea. I've been married so long I took ours down. I felt kind of weird with it up. Now I think I'm gonna go get it out again. I LOVE this. Great job! 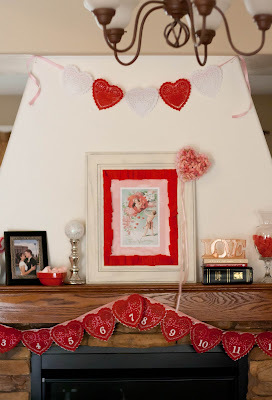 I am so in love with this mantle…it may be my favorite one you've done! 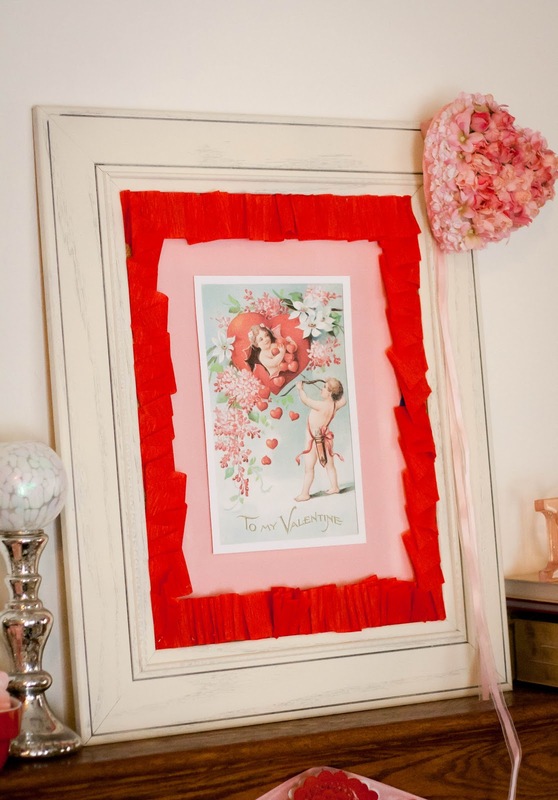 The vintage Valentine framed in crepe paper is truly fantastic. Great work again, Kendra! I really like it all. Great idea with the print over the glass. I'd even call it brilliant. 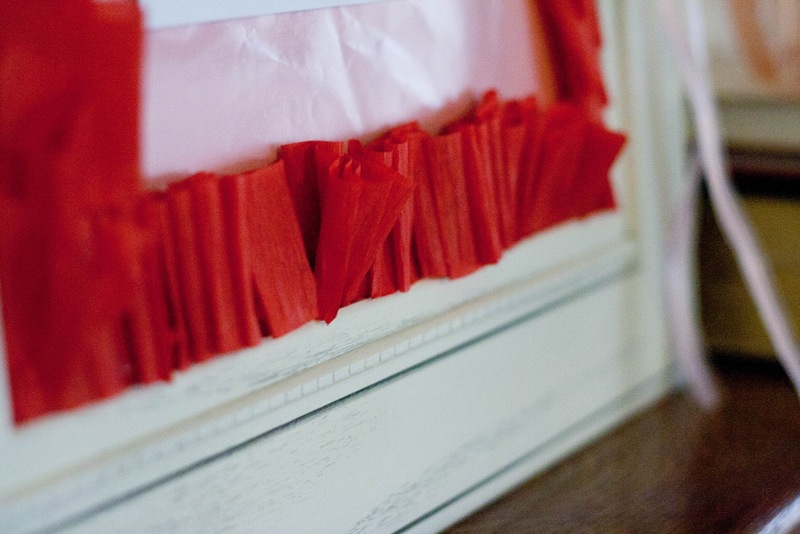 I love the way you used crepe paper on that pictureframe! That would work well for so many other purposes…thanks for the inspiration! Beautiful! Fab ideas and I'm so loving your tabs at the top of your blog.